Washington, DC - The Bashar al-Assad regime in Syria is a menace to the Syrian people and its neighbors in the region. As an enabler of Iranian expansion and Russian force projection it also presents problems for the United States and its allies. Conventional wisdom seems to be that Assad's final victory is close at hand and will be accompanied by a return to business as usual. 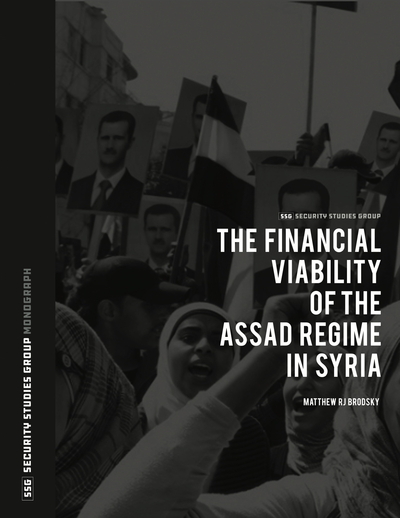 The Security Studies Group examined what kept the regime financially afloat in order to identify future non-kinetic pressure points that can impact the behavior of the regime and its sponsors. Security Studies Group Senior Fellow Matthew RJ Brodsky explored the major sources of regime revenue, both internal and from outside patrons, and its economic structure. The full monograph can be downloaded here (PDF). The Syrian civil war destroyed three-quarters of the national economy and wreaked havoc on all sectors, but the regime of Bashar al-Assad was able to weather the storm. While Iran and Russia secured his rule and turned the tide of the war in his favor, Assad managed to remain financially afloat by taking several actions, beginning with exhausting Syria's cash reserves. To that end, Syria's foreign exchange reserves declined from $21 billion in 2010 to less than $1 billion by 2015. Current estimates put this number at around $1.3 billion. Corrupt international organizations have cut deals with Assad's associates worth millions of dollars. In most cases, the Syrians involved are under U.S. and EU sanctions. Syria's energy sector was hardest hit with oil GDP declining by 93% from 2010-16. Iran's military spending ballooned to $23 billion in 2017 representing 22% of government spending compared to 17% in 2014. Granting lucrative terms on the expansion of Russia's naval base at Tartous and the Khmeimim air base near Latakia. Iran's repopulation schemes along its land corridors using the families of Shi'a militia members and others loyal to Iran. Iran and Russia may have won the civil war for Bashar al-Assad but they lack the means to finance Syria's reconstruction. As Assad regains degrees of control over additional swaths of territory, his patrons are banking on the understanding that those who stood by him and his regime militarily will be rewarded the most financially through reconstruction contracts worth billions of dollars that only he can guarantee. Russia has been able to secure a larger share of Syrian resources, in part, because Assad recognizes that that Russian President Vladimir Putin represents the proverbial adult in the room when it comes to securing international financing for reconstruction. With the return of sanctions against key individuals of the Iranian regime and large sectors of its economy, Iran's enhanced public profile inside Syria will likely dampen international enthusiasm for the funding of reconstruction projects. For now, Moscow requires stability in Syria while Tehran looks to continue the peaceful imposition of an Iranian post-war order on the country. They are both counting on the normalization of the Assad regime in the eyes of the international community and they view the withdrawal of U.S. forces as an imperative. Indeed, America's absence will help facilitate these goals. In the meantime, there is no reason to believe that any foreign aid that touches Bashar al-Assad, or reconstruction funds that reach the regime, will do anything but improve the lot of regime loyalists, not those worst impacted by the conflict.